It looks like you can teach an 84-year-old a new trick. Pope Benedict XVI launched the Vatican’s news information portal via Twitter on Tuesday using, what else? An iPad. This is the latest in a series of moves from the Vatican to improve communication both internally and with the public. But don’t be fooled by all the “Benedictus” handles on Twitter, the Pope does not have a personal account. The papal tweet was sent from @news_va_en. Check out the pontiff working the touch screen in this video released on the Vatican’s YouTube Channel. Yes, the Vatican’s been on YT since 2005. “It’s amazing what we don’t know about how the brain functions,” Biden said. “For the first time in human history, significant resources and human capital are being applied to unlock how to catch that lightning.” REUTERS has more on the story. CURE was founded in 1998 by Susan Axelrod, wife of former White House senior Adviser David Axelrod, and other parents frustrated with their inability to protect their children from the devastation of seizures and the side effects of medications. 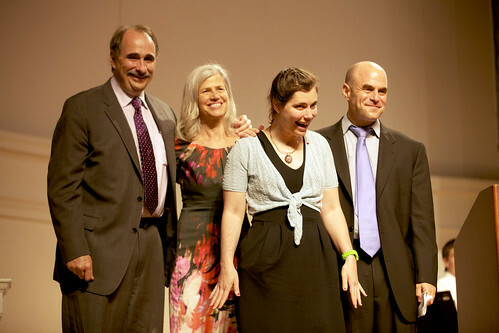 The Axelrod’s daughter, Lauren, lives with the disease. “There is no lonelier feeling — and many of you have experienced it — when you know your child has a chronic illness which can’t be controlled,” David Axelrod explained. Epilepsy affects over 3 million Americans of all ages and some 50 million people worldwide. It can develop at any age and may be a result of head injury, brain tumor, stroke and many other unknown causes. Chicago Mayor Rahm Emanuel and Illinois Governor Pat Quinn were among the 900 people attending the gala that raised almost $800,000 for the nonprofit organization. In addition to the Vice President’s keynote speech, the event featured Peter Sagal, Host of NPR’s “Wait Wait… Don’t Tell Me.” Since its founding, CURE has raised $15 million to fund epilepsy research and has has awarded over 107 cutting-edge projects. More information about CURE can be found at cureepilepsy.org. WHCI is proud to support the work of CURE and if you would like to donate, please click HERE. The video below premiered at the annual CURE gala and features poignant, personal stories of families who have battled epilepsy. With New York Rep. Anthony Weiner’s political future unknown, perhaps the most interesting development is the possibility of actor Alec Baldwin trading in “30 Rock” for the Gracie Mansion. NYC Mayor Michael Bloomberg is not running in 2013 and now that Weiner, the leading candidate, is in texting turmoil that leaves the field wide open. Read The Daily exclusive here to see what the actor’s friend said about Baldwin stepping in as a high profile Democratic candidate. In a recent interview, Fox News President Roger Ailes seemed to shift from his traditionally conservative stance and may have developed a bit of a soft spot for some top Democrats. In an interview with Howard Kurtz, Ailes – the man who put Sarah Palin back on television – even said he’d hire Hillary Clinton: “She looks unhappy at the State Department. She’d get ratings.” See the full story on The Daily Beast here. At approximately 4 o’clock eastern time on Monday, June 6th Rep. Anthony Weiner admitted to sending the many lewd photos that have by now made him infamous in the media. He has also said that he does not plan to resign and apologized to his family and constituents for his mistake. Below is the full coverage of the conference from Politico. “Bob [Bauer] is a good friend and has served as a trusted advisor for many years. Bob was a critical member of the White House team. He has exceptional judgment, wisdom, and intellect, and he will continue to be one of my close advisors,” said President Obama in a statement announcing the change of staff. Bauer will go back to the private sector to resume his position at Perkins Coie and will work on Obama’s reelection campaign. He will officially leave the White House at the end of June. Kathryn Ruemmler currently serve’s as Bauer’s deputy and has been at the White House since January of 2010. Ruemmler will be the third White House counsel for this administration (after Bauer and Greg Craig). Prior to the White House, she served at the Department of Justice and, at the office of Latham & Watkins, and was a co-lead prosecutor in the Enron investigations. For the full announcement go here.